Nivea Q10 Anti-Age Hand Cream effectively cares for your skin's natural beauty of your skin and helps prevent first signs of ageing. Do you want a hand cream that effectively cares for your skin’s natural beauty and helps prevent the look of aging? 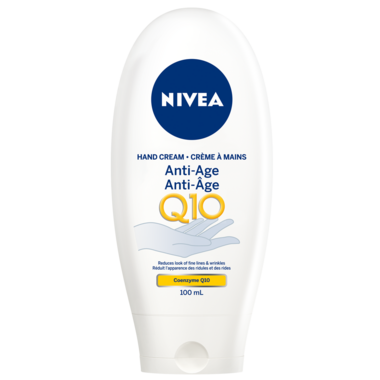 Try Nivea Q10 Anti-Age Hand Cream – The smoothing hand cream with Q10 helps to visibly reduce the appearances of fine lines and wrinkles with regular use. This powerful Q10 Plus hand cream is enriched with Q10 coenzyme and helps keep the skin looking younger. Nivea's Quality promise: Dermatologist tested. Great product, wonderful fragrance, leaves hands, soft and smooth. My favorite product for hands. Love this hand lotion. Very silky feeling. Stays on your hands, does not leave marks items you might touch after applying. My husband also uses this product and finds it helps his dry hands. Will definitely continue to purchase this product.